Boris Johnson’s deputy says there could be a referendum on the deal, after claims David Davis could quit over the Ireland issue. The government “expects” a Brexit backstop solution to the Irish border issue to end before 2022, after Theresa May acted to ease the concerns of her Leave-supporting ministers. The prime minister appeared to have avoided a full-blown Brexit crisis and an explosive cabinet resignation after a “constructive” discussion with Brexit secretary David Davis on Thursday morning. This will see the UK retain parts of the EU’s customs union in the event of a wider UK-EU agreement finding no solution to the issue; but Brexiteers had become concerned as to whether the proposal would truly be “time-limited”, as promised. To add to the confusion surrounding Mrs May’s government, Foreign Office minister Sir Alan Duncan, told an audience in Berlin on Thursday it was “possible” that a vote on the terms of an exit deal could happen – but it could not reverse Brexit. They would be able to vote on the terms, including the backstop plan – but international trade secretary Liam Fox, a Brexiteer, dismissed the idea. The Cabinet Office’s Northern Ireland border document states: “The UK is clear that the temporary customs arrangement, should it be needed, should be time limited, and that it will be only in place until the future customs arrangement can be introduced. “The UK is clear that the future customs arrangement needs to deliver on the commitments made in relation to Northern Ireland. “The UK expects the future arrangement to be in place by the end of December 2021 at the latest. Another paragraph clearly states the temporary customs arrangement will be “time-limited” and will come into force after the Brexit transition period ends in December 2020. The document also states the UK will be able to “negotiate, sign and ratify” free trade agreements with non-EU countries while the backstop is in place. And the paper adds a temporary arrangement “could only be provided in law” if an EU-UK divorce deal and a future partnership framework are agreed. The EU’s chief Brexit negotiator Michel Barnier welcomed the publication of the UK proposal but said Brussels would “examine it with three questions”. These were whether it is a “workable solution” to avoiding a hard border; whether it respects the “integrity” of the EU’s single market and customs union”; and whether it is an “all-weather backstop”. The Republic of Ireland’s Deputy Prime Minister Simon Coveney said he looked forward to discussing the UK’s proposal with Mr Barnier’s team. Claiming there is “clearly a great deal of work” remaining to be done in Brexit negotiations, Mr Coveney said: “Our strong preference remains an overall EU-UK future relationship which would resolve all issues. But, the European Parliament’s Brexit coordinator, Guy Verhofstadt, offered a gloomier verdict on the UK proposal, saying it was “difficult” to see how it would deliver a “workable solution” to avoiding a hard border and respect the integrity of the single market and customs union. “A backstop that is temporary is not a backstop, unless the definitive arrangement is the same as the backstop,” he added. In further signs Theresa May’s cabinet is at odds with each other, Boris Johnson reportedly told a dinner of Conservative Way Forward donors on Wednesday that Brexit is in danger of being sold out as the government is terrified of short-term economic disruption so the UK could effectively remain in a customs union. According to BuzzFeed News, the leading Brexiteer joked to the Thatcherite campaign group that Donald Trump would “get somewhere” if he was leading the Brexit negotiations. And he reportedly said it is “beyond belief” the Northern Ireland border had become an obstacle, dismissing concerns about disruptions as “pure millennium bug stuff”. International trade secretary Liam Fox attempted to quell the anger, saying people must be patient as leaving the EU is “complex”. He told Sky News: “There has never been a period where government have been asked to do such complex things as we’re being asked to do around the Brexit process – disentangle Brit after 40 years of EU membership – and there are, I imagine, a number of issues that will still come up that will be difficult. “The point is, do we reach quick decisions or do we reach the right decisions? “This was a difficult decision to take because it involved the balance of a number of different issues. We decided it had to be done on the basis of collective responsibility – in other words, everyone signs up to it. 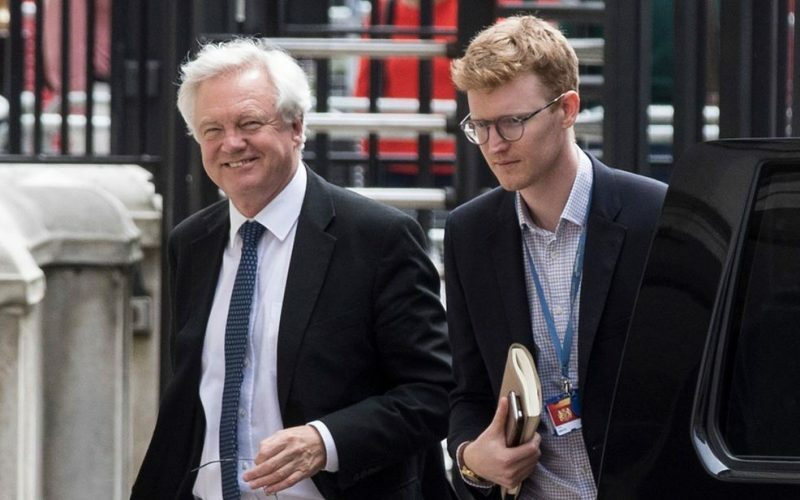 In a morning of speculation at Westminster, Mr Davis’s chances of resigning – and delivering a damaging departure from Mrs May’s cabinet – had earlier been judged at “50-50” by a source close to the Brexit secretary. Tory MP Nadine Dorries had also ramped up the political drama by citing Mr Davis’s SAS training, as she warned he is “trained to survive” but also “trained to take people out”. A source close to Mr Davis said: “Obviously there’s been a back and forth on this paper, as there always is when the government publishes anything. Labour’s shadow Brexit secretary Sir Keir Starmer characterised Thursday’s events as “another embarrassing day for the government”. He said: “The clock is ticking on the Brexit process and it is imperative that an agreement is struck which will protect jobs, the economy and ensure there is no hard border in Northern Ireland. “Instead, with the threat of a cabinet resignation, Theresa May has signed up to a flawed proposal which is inconsistent with her earlier commitments.